CHALET PRALINE IS ALSO NOW PART OF THE SUMMER MULTIPASS OFFER - SEE OUR "SUMMER IN MORZINE" PAGE FOR MORE DETAILS. This incredibly spacious Alpine chalet has 5 large bedrooms and 4 bathrooms, and is built and furnished to a high standard. Situated in a secluded residential development near the village of Essert Romand, the chalet is 3.5km from Morzine, and 1km from the nearest bar/ restaurant. There are open fields below the chalet (great for kids!) and wonderful views of the peaks of Nantaux and Chésery. Chalet Praline has plenty of space to lounge around on the huge comfortable sofas in front of the fireplace, and there's a large antique dining table with mountain views, across a breakfast bar from the fully equipped brand new kitchen. On the top floor above the lounge there are 2 huge ensuite double bedrooms; one is a king with ensuite bathroom with bath, overhead shower and WC, and the other is a double, with ensuite shower and WC. Both have balconies. In between these two bedrooms is a spacious mezzanine area with pool table and WC. On the lower floor, which overlooks the garden & fields, there are 2 twin bedrooms, 1 large triple bedroom (3 single beds) and 2 bathrooms, (both with bath, overhead shower and WC), a utility room and sauna. There is plenty of hot water due to the 2 large capacity hot water tanks in the utility room. All bedrooms have ample storage, the beds have throws, cushions and matching curtains, and are very comfortable. The chalet also has a large garage which can be accessed from the lounge. 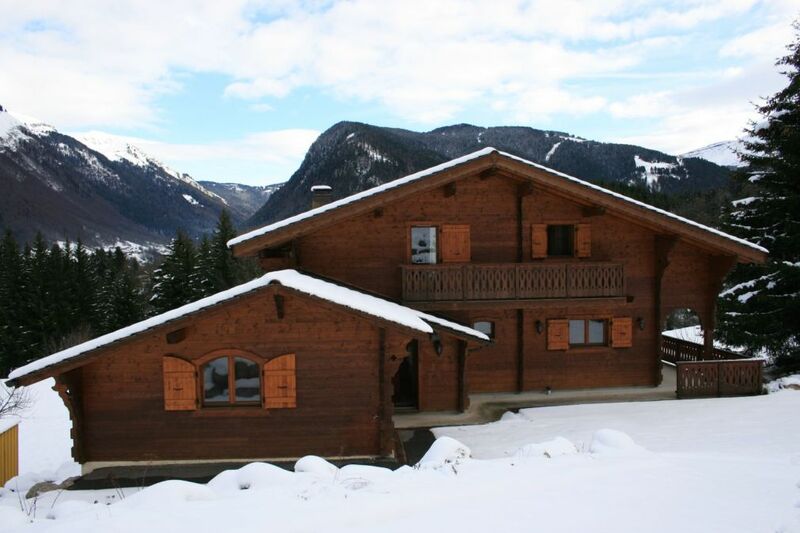 Chalet Praline represents extremely good value for a group or family skiing or mountain holiday. We recommend that you have your own transport when staying at Chalet Praline (though there is a "Balad'Aulps" local bus service which runs through Essert Romand to Morzine 7 times a day in each direction and stops approx 200m from the chalet). There is ample parking on the tarmac driveway. The Carrefour hypermarket is 8 minutes' away by car. In winter season it is essential to have snow chains for your car, in case of heavy snowfalls. This chalet operates on a Sunday changeover in winter season, and we can be flexible with arrival days in the summer season. It is possible to book Chalet Praline fully or part catered – ask for information or see Catering options. NOTE ON SUMMER PRICES: "high season" applies to all dates from 30TH June - 1st Sept. "Low Season" applies to all other summer dates.